Speaking of yachts, not only their technical features are noteworthy: waterlines, building materials and somewhat basic, technological else utilized in designing and building them make for a high - tech finished product, but some impressive characteristics make very often the difference, above all in the field of superyachts. 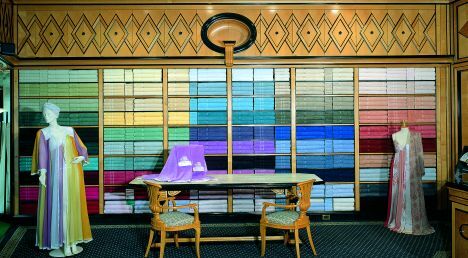 An owner makes his craft a unique by choosing suitable interior decors, for areas where he spends a lot of time when on board. At present, builders consider Sport Motor Yachts with a sleek, high - performance design and displacing shuttles made for ocean crossing alike. The owners of the former prefer minimalist - styled and light spaces while who buys a shuttle goes usually much for classic, warm, sometimes luxurious décors. To the latter appeal Cesari's Collections offering fabrics for either classic or modern décors, curtains, fireproof fabrics or home linens since over fifty years. There is no doubt at all: the Cesari's Fabrics is one of the referents either in Italy or abroad in decoring museums, theatres, hotels, embassies, villas and yachts; moreover, he supplies the Presidency of the Italian Republic, the Presidency of the Chamber of Deputies and the Italian Minister of Foreign Affairs. Cesari proposes eagerly their collections to the yachting world appropriate products that can satisfy the most demanding customers offering them a great range of precious curtains and fabrics such as lampas, damask e liserés, cottons, lines and silks for interior; the fireproof or washable fabrics listed in the catalogue are the ideal choice for covering the external areas. At present, the most owners prefer the Alabaster Collection, a mix of damask and silk, the Samarcanda, a lampas in silk and flax with soft tones and the Mediterranean and Sahara Collections in high - tech fabrics. Cesari has recently brought out the Melograno Collection, a lampas in silk available in nine different tones. To the most demanding owners, Cesari proposes his fine, custom - collection of linen and bath - towels.